Gasketed plate heat exchangers (PHE) meets almost all of heat transfer requirements. They are highly flexible with a wide range of models. Connection sizes range from 1″ to 16″. Plate materials are available in a wide variety such as stainless steel 316, 304 and titanium. Other alloys for corrosive applications such as Hastelloy, Nickel and monel are also available. A flat plate heat exchanger transfers heat between two different fluids using metal plates to separate the fluids. The fluids move between the gaps in the plates. The plates are corrugated in a chevron pattern causing high turbulence in the fluids. The high turbulence and high surface area of the plates results in a higher efficiency of heat transfer than conventional shell and tube heat exchangers. Because the flow pattern causes high turbulence of the fluids through alternate channels – this results in a higher heat transfer rate allowing for a more compact design reducing material cost since the heat transfer surface requirement is much lower than a conventional heat exchanger. High turbulence results in less fouling – therefore less down time for maintenance. Easily add capacity as expansion is required by adding plates to the heat exchanger. Can be opened without disturbing the piping. Closer temperature approaches of up to 2°F maximizes heat recovery for a wide variety of applications. Minimal space required for opening or closing the heat exchanger allows for easy maintenance. Ideal for mounting on a skid. 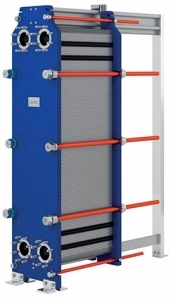 Plate and frame heat exchangers consists of a pack of thin metal plates with openings for the passage of the fluids. The plates are corrugated which means that each pair of adjacent plates in the heat exchanger forms a channel. Every second channel is open to the same fluid. Between each pair of plates there is a rubber gasket, which prevents the fluids from mixing and from leaking to the surroundings. 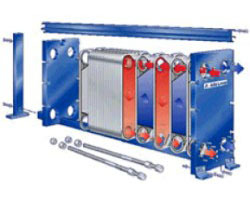 When the media enters the plate and frame heat exchanger via the connections in the frame, it’s directed through alternate channels by the gasket arrangement. The warm fluid flows through every other channel and the cold fluid through the channels in between. Heat is thus transferred from the warm fluid to the colder fluid via the dividing wall, i.e. the plate material. The corrugations support the plates against differential pressure and create a turbulent flow in the channels. In turn, the turbulent flow provides high heat transfer efficiency, making the plate heat exchanger very compact compared with the traditional shell-and-tube heat exchanger. The Double-Wall Plate Heat Exchanger* is a technical breakthrough for heat exchange for media between which a hostile or undesirable reaction can occur, if the two fluids should mix. The Double-Wall Plate Heat Exchanger is therefore a new alternative to traditional heat transfer equipment such as the double-wall shell-and-tube heat exchanger, the triple-tube shell-and-tube heat exchanger, the double-circuit intercooler, and coils for indirect heating. Watch the animation below to learn how a plate heat exchanger works, covering the basics and working principles of Alfa Laval gasketed plate heat exchangers.